High finance, family dysfunction, death — and laughs. 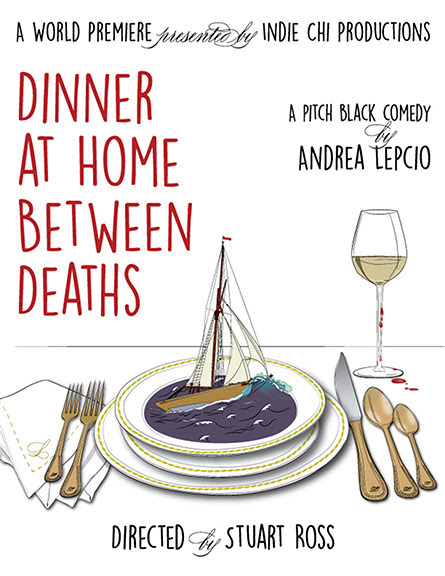 The world premiere of Dinner at Home between Deaths, a pitch-black comedy by Andrea Lepcio (Looking for the Pony), directed by Stuart Ross (Forever Plaid) and presented by Indie Chi Productions, opens as a guest production at the Odyssey Theatre on April 2. Inspired by the Bernie Madoff scandal and other Ponzi schemes before and since, Lepcio’s comic thriller examines the American dream and American identity in the face of eroding ethics. The Indie Chi production stars, in alphabetical order, Amielynn Abellera (title role in Se Llama Cristina at Theatre @ Boston Court), Diane Cary (NBC mini-series V), Andrea Evans (three decades on One Life to Live as Tina Lord) and Todd Waring (ABC Family series Chasing Life). Performances of Dinner at Home between Deaths take place Fridays and Saturdays at 8 p.m. and Sundays at 2 p.m., April 2 through May 8. There will be two preview performances on Thursday, March 31 and Friday, April 1, both at 8 p.m. All tickets are $30 (reserved seating) except previews, which are $15. The Odyssey Theatre is located at 2055 S. Sepulveda Blvd., West Los Angeles, 90025. For reservations and information, call (323) 960-4429 or go towww.plays411.com/dinner.